Prevent hazards caused by the improper disposal of smoking materials by strategically placing cigarette receptacles and snuffers around landscape spaces. This basic concrete sand urn offers plenty of room for safe disposal. Constructed with fire resistant, ASTM compliant, steel rebar reinforced concrete, this smoking urn will maintain its structural integrity even in the most demanding conditions. Available in an array of popular standard and premium colors and finishes. 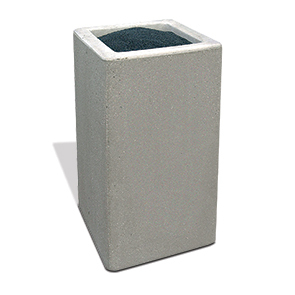 This square concrete smokers urn comes standard with a 10lb. bag of sand to fill the unit to and aid through proper suffocation extinguishing of any smoking material.